Covering the film news in last few days have been very strange to say least. From the threats, to theaters pulling The Interview, to Sony cancelling the film completely, all hope seemed lost. The studio still has no plans on showing the political satire in any format, but wants to remind us that it is still out there by releasing a new teaser trailer with a slight propaganda spin to it and the Christmas Day release still attached to it. The latter might not mean much considering the teaser could have been created in anticipation for the film’s release, and if that is the case, it is strangely coincidental that the teaser would have the “In Franco and Rogen We Trust” tag attached to it. Does this mean VOD is on the way? Hit the jump to watch the teaser. 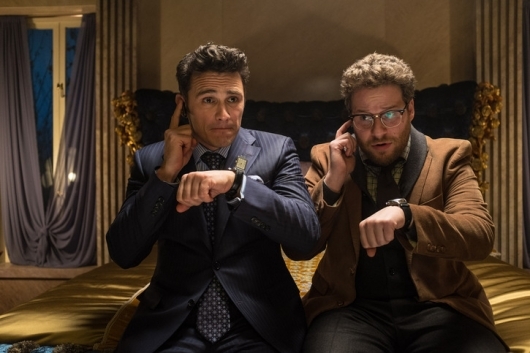 This week, Sony canceled the release of The Interview, the highly controversial political satire starring James Franco and Seth Rogen, after North Korean hackers threatened 9/11-style attacks on any theaters that screened the film this Christmas. 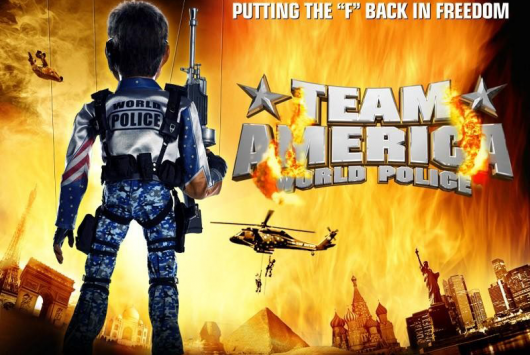 Once The Interview was pulled, the Alamo Drafthouse in Dallas announced its plans to show instead Team America: World Police, the 2004 satirical comedy from South Park creators Trey Parker and Matt Stone’s that featured a world police team on a mission to combat a terrorist plot led by Kim Jong-il, the father of current North Korean leader Kim Jong-un. (Marionettes are used in the film instead of actors.) Now, Paramount Pictures has reportedly pulled the planned Team America screenings. Now that Sony has apparently thrown in the white towel with their not-upcoming-anymore brutally honest and eye-opening documentary on North Korea, The Interview…wait, it’s not a brutally honest and eye-opening documentary about the Democratic People’s Republic of Korea supreme leader Kim Jong-un? It’s actually a silly satirical comedy starring Seth Rogen and James Franco? Well, that’s weird. Someone should let them know. While many theaters are running from all of this madness, the Dallas/Fort Worth Alamo Drafthouse has decided to turn up a defiant middle finger. The theater will replace The Interview with a special screening of South Park creators Trey Parker and Matt Stone‘s satirical marionette puppet comedy Team America: World Police. Read more about the event below. A video has been making the rounds recently and it’s quite brilliant. Obviously if you’ve heard this song, you know it’s one of the greatest songs ever created. You also know there’s a bit of language involved that would be considered NSFW, so continue forward with caution. You can see the Captain America/Team America mash-up by clicking over now.